Every time the internet starts to let me down, not updating its precious, delicious podcasts fast enough or making me feel like I can no longer garner true enjoyment from it, something phenomenal comes along. It's kinda like love and money that way, isn't it? Right when you think the whole situation is fucked beyond repair, something comes along because you stop looking. Maybe it's not exactly like that. I might be exaggerating. Then again, I might not be, so let's be safe. This is a review-ish thing about an album of covers. Specifically covers of the Smiths, but since we all already know the Smiths, and in these cases a simple link-and-wink (TM) will suffice, I don't want to belabor the whole review thing. Instead, let's look to one amazing Tumblr called Copy Cat that appears to house just about the best of any song that anyone can or will or wants or thinks to cover. You want to hear "The Suburbs" by Arcade Fire covered? You got it. If you like Ryan Adams, but wish he'd do some Elton John? Sure. Or maybe just reworkings of great songs like the National's "Mr. November" or Feist's "Let It Die" will float your proverbial boat? It's a beautiful and perfect way to spend an evening, just scanning through, listening and realizing the sheer volume of talent in the music world. Go there now! Do it! Well, wait, for a second actually. I'm almost done. 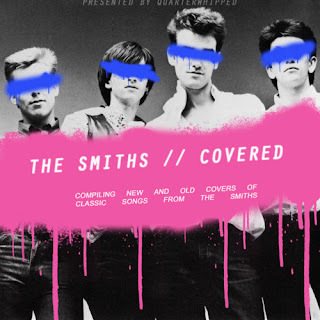 From Copy Cat, I found a phenomenal collection, free for download, of Smiths covers. And yeah, covers aren't everybody's scene. That's cool. But, some of the artists involved in this collection are as follows: Stars, Spoon, The Morning Benders, Dum Dum Girls, At The Drive-In, She & Him and... and... many more! While this is just a collection and not a more strictly designed album project, and it does have some hitches and minor errors in the recordings, it's a really compelling and enjoyable compendium featuring pretty much all of the Smiths best songs. So, if you like the Smiths, hey, here's your ice cream... It's a pile of Smiths songs. But look out for the chocolate sauce and jimmies, because those are the great cover artists. Really it's just some phenomenal work. Especially with She & Him's turn on "Please, Please, Please Let Me Get What I Want," Colin Meloy's version of "Ask," and "Panic" as covered by Spoon. A lot of these are live recordings, but goddammit, let's not be so picky. You should, not just can, but should download this compilation from Perfect|Midnight|World right now. It may not be news, but it's new enough.